Mark Torrendor is a blogger with an eye for interior design. In this article Mark draws on his extensive experience with Crystals and Gemstones from his time at CrystalAge.com takes on crystals in the home and how you can get the most out of them in your free space. Crystals and precious stones have always fascinated human beings throughout civilization. Greek soldiers would rub hematite over their bodies before battle, in the belief that they made themselves invulnerable. The ancient Egyptians used a range of crystal including lapis lazuli, turquoise, emeralds, and more in their jewellery. Jade was highly valued in ancient China. With the advent of the New Age culture in the 1980s, people drew upon old traditions to use crystals as for healing. Crystals of all varieties were kept in the home by crystal healers. Both healers and clients alike admired the natural beauty and breathtaking colour of crystals as well as how they reacted to light and accentuated the décor of whichever room they were placed. It wasn’t long before attractive minerals such as amethyst and clear quartz began appearing in homes, dotted about as forms of decoration. There seems to be no end to what crystals can do to brighten up one’s personal space. Whether rough or polished, small or large, clear or opaque, crystals are marvellous conversation pieces and bring colour and shine to even the most dimly lit room. 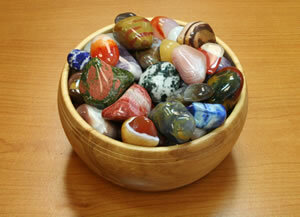 Tumblestones are wonderfully versatile and can be used in many ways, both indoors and outdoors. A tumblestone is a crystal or gem that has been tumbled in a rotating barrel until perfectly smooth. Try placing a collection of different coloured tumblestones in a bowl or on a dish and set them on your coffee table or on a shelf. Tumblestones also look great when placed in a plant pot surrounding the base of the plant. While crystals on their own make great decorative pieces, objects made from specific crystal can be equally as captivating. Jasper buddhas, Amethyst angels, Onyx animals, Hematite Chinese dragons, and Quartz crystal skulls are some very popular home décor items that are out there right now. Some people just like the way these objects look, others find that they are helpful as points of focus when meditating. Even the more mundane of household objects can become things of beauty when rendered in crystal. Crystal lamps, candle holders, and bookends are far more interesting than the random IKEA equivalents. Other than natural beauty, crystals are becoming increasingly popular for the metaphysical properties they are believed to possess. There are dozens of crystal types that are said to have healing powers, as well as the ability to repel negative energies. Amethyst crystals have a gorgeous purple radiance and bring elegance and glow to any room but are also considered to be one of the most powerful healing crystals. It has often been used to absorb negative energies. According to crystal healing experts, having one or more amethyst clusters in your home will give your living space a lift but will also raise the energy levels and create positive vibrations. Having a selenite gypsum lamp within a room is said to keep the energy lively and is also ideal for a crystal healing treatment room for those healers who work from home. Black tourmaline is considered to be one of the best crystals to block the negative effects of electromagnetic radiation from PCs, televisions, and other electrical items. Some crystal enthusiasts who set a piece of black tourmaline between themselves and their PC as a form of protection from these energies, known to cause headaches and stress after overexposure. Then, of course, we must mention crystals and their use with feng shui. Practitioners of this ancient Chinese art (concerning the flow of energies within one’s environment) will often use various crystals to restore balance and bring vitality. Clear quartz is often placed at various points in the home as a way of clarifying energy. Clusters or pyramids of apophyllite are attractive alternatives. Whether used for decoration or meditation, crystals have a raw beauty that cannot be denied. Their intriguing shapes and variegated colours make them a sparkling addition to any home.